United Communist Party of Nepal (Maoist)’s (UCPNM) extended plenum is kicking off today. Chairman Prachada will seek approval to his political document, which is already endorsed by the central committee, from more than five thousand cadres justifying his line post split scenario. After a faction, led by former Vice Chairman of the UCPNM broke away from the party accusing him of deviating from the party line the time has come for him to firmly rein the party and consolidate his grip or depart to oblivion. For more than a decade and a half Prachanda has been at the center of every political debate of the country. His every move and word was watched, weighed and analyzed. When his party took the peaceful path, after a decade long violent people’s war to topple Monarchy, he was suspected by the parliamentary parties for using the parliamentary politics to further the party’s agenda of communist state. Later when he was able to establish his credentials with the frowning parties he was rebuffed by his colleagues for betraying the party’s agenda! He was accused of selling out to ‘expansionist’ (read India) and betraying the anticipated revolution. The accusations are yet debatable. Earlier, even his opponents believed that if someone in Nepal was capable of taking Nepal out of crisis it was Prachanda. After the demise of former Prime Minister of Nepal Girja Prasad Koirala, a co-signatory of the Comprehensive Peace Agreement, Prachanda stature rose unprecedentedly. Being the sole signatory alive, he promised to take the peace agreement to its logical conclusion. He consented to show the maximum flexibility on the contested issues of the agreement. He stood by his words scrupulously. He agreed on returning land seized from the landlords during people’s war and in the modalities of Army Integration. He even agreed to form a multi-identity based federal system in Nepal against his own party line of creating single identity based federalism. However, in a hurry to appease the parliamentary parties and influential neighbor he lost confidence of his long trusted comrades. These comrades, who have now formed a new party, had a long association with him. Before and during People’s war the departed comrades formed the core group which took all the major decisions and played the most important role in extending the party’s influence in the country. Although Prachanda can boast of retaining the chunk of commanders who led the battles nevertheless majority of the dedicated lower rung cadres of the former people’s army have joined the new party. Principally they have formed the ‘voluntary group’, a misnomer for people’s army. Moreover, to Prachanda’s dismay, of 26 odd sister organizations of the UCPNM, 19 have consented to join the new party. 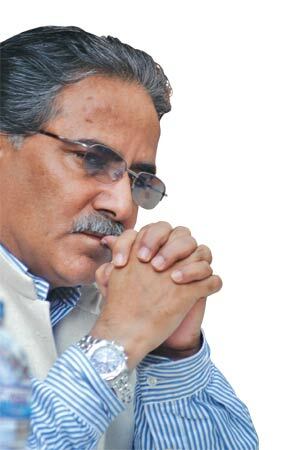 Prachanda today is left with very few comrades he can trust or who still trust him. Majority of the present central committee members are those who have joined the party shortly before the initiation or during the people’s war. Some of the big names in the party like Ram Karki, Devendra Poudel, and Haribol Gajurel were formerly the members of the party led by current Prime Minister Baburam Bhattarai. They joined the party along with him. Current Education Minister Dinanath Sharma joined the party during the people’s war. He was inducted into the party by Baburam Bhattarai. Similarly many who joined after the party abandoned the violent struggle do not hold loyalty towards Prachanda. They are loyal to their former comrades. Today there are three strong groups in the party. In this backdrop, Prachanda must have realized by now that if he has to retain influence in the party he has to create an atmosphere where all the groups merge to form one. His political document highlights this need. If anything Prachanda wants last is to see another challenge to his supremacy. Until recently he played one group against another. He pacified radicals by showing them the danger of Baburam’s ‘revisionist’ line and countered radicals by taking support from Baburam. Now, with the departure of radicals, he has come face to face with the person who had always challenged his leadership. Baburam Bhattarai is someone who nurtures ambitions similar to him. This was not the case with the radicals for they were content in his leadership. This plenum will test Prachanda’s mettle. He has to convince participants that he is still the supreme leader and his idea of revolution is best suited for the condition of Nepal. Moving further he also has to force other senior leaders, including Baburam Bhattarai, to fall in line. In case he could not he will loss the fight and this time for ever. This entry was posted on July 19, 2012 at 9:39 am	and is filed under Nepal. Tagged: Baburam Bhattarai, Maoists, Nepal, Prachanda, UPNM. You can follow any responses to this entry through the RSS 2.0 feed. You can leave a response, or trackback from your own site.